Many of my paintings are available as high quality prints. Some are sold as limited editions, which are signed and numbered by me as well as being distrubuted by me. These are either lithographs printed on offset pr or original serigraphs ceated by me in my studio. Click on any image to go to the limited edition prints page for larger images and for purchasing online. 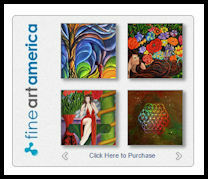 Many are distributed through Fine Art America. There you can purchase prints in various sizes, on various types of surfaces and even printed in many different forms from throw pillows to cell phone cases. [CLICK HERE] or on the image to the left to link to all the images.